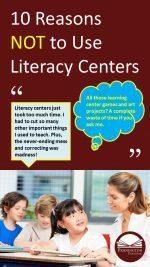 Literacy Centers have been used by some teachers for years, but have become increasingly popular since the advent of Pinterest and the Teachers Pay Teachers “Culture of Cute.” Before getting into my 10 Reasons Not to Use Literacy Centers, a huge disclaimer is in order. I love literacy centers, and as a reading specialist and author of a reading intervention program, which offers a centers-based approach to assessment-based instruction, I find them to be invaluable instructional tools. Plus, I also sell grades 4, 5, 6, 7, and 8 Academic Literacy Centers. However, I don’t love the ill-conceived and poorly implemented literacy centers I see struggling in so many elementary and middle school classrooms. Hence, the 10 Reasons Not to Use These Kinds of Literacy Centers. 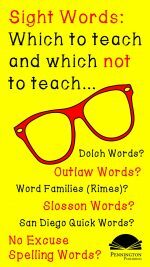 So, here’s the list of reasons I’ve compiled not to use literacy centers. But don’t take my word on it, check out the teacher comments as well. out. All time is reductive: You add this and that has got to go. Plus, centers can take an inordinate amount of class time. Some teachers have abandoned direct literacy instruction altogether and do two-hour literacy centers. As a reading specialist, I can assure you that guided reading is not the only effective form of reading instruction. Plus, those literacy center learning packets, “I Can” statements, recording sheets, etc. take way too much time to correct and record. 2. ORGANIZATON: Literacy centers are an organizational nightmare. Bins, bags, folders, cubbies? Office supply stores love literacy centers. Artsy-fartsy project-centered activities in literacy centers cost teachers money they just do not have, and the MESS. Students cleaning up? Let’s face it; it’s not their skill set. And by the way, elementary teachers… middle schoolers are worse at cleaning up by far. Custodians hate literacy centers… not only because of the chair or table positioning, but because of the continual mess, wear and tear on classroom furniture and flooring. 3. FUN: So many of the literacy centers I see selling on teacher sites such as Teachers Pay Teachers focus on creating activities, which students will like. Of course, students would rather play a literacy board game rather than practice reading fluency. Wouldn’t you? However, we teachers are not in the amusement business; we are in the learning business. Whether students enjoy the activity or not is not the end goal. Wouldn’t you rather have a former student bumping into you at a restaurant ten years later tell you, “I learned so much in your class,” rather than “I had so much fun in your glass.”? A focus on fun and a focus on learning are mutually exclusive in my experience. The productive kind of fun comes from peer and student-teacher relationships and the self-fulfillment of actually learning something. makes sense (motivation and learning theory so affirm); however, allowing students to self-select books irrespective of reading level seems to be teacher malpractice to me. 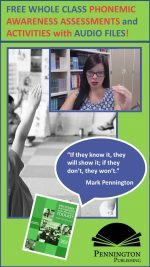 My experience in the classroom finds that some students will self-select challenging books at appropriate word recognition levels, but many will not. No research that choice presents higher gains. Literacy center choice? We are the adults, here. We know the Common Core Standards and what is best for our students. We guide them toward vegetables, not candy. 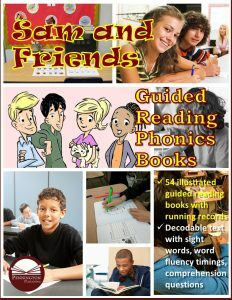 And if we’re good at it, we can make them think that they do have some choice, say in when to practice that reading fluency passage, where to practice it, and how to practice it. These choices make sense, but not these kinds of literacy choices: board game or reading fluency, art station or reading fluency, etc. 5. CUTE: Other teachers and culture often unduly influence impact a teacher’s instructional decision-making. I know many teachers who have been peer-pressured into adopting and/or continuing literacy centers as their primary means of literacy instruction. 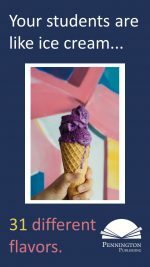 The “Culture of Cute” promulgated by many teachers on Teachers Pay Teachers and influenced by Pinterest has had an enormous impact on elementary, and some middle school, literacy teachers. A teacher’s artsy-fartsy, cute-looking literacy centers may, indeed, impress the teacher next door, the walk-through principal-specialist-district personnel, and the parent community. However, cute alone never gets a student to score high on the Smarter Balanced or PAARC tests, let alone the SAT or ACT in years to come. 6. INDEPENDENCE: Literacy centers focus on independence and de-value teacher-dependence. “Gradual release of responsibility” does not mean let the blind lead the blind. Poor literacy centers allow students the independence to do what students want to do by themselves; better literacy centers involve students completing work independently without pestering the teach or being spoon-fed to do by themselves what the teacher wants them to do. The best independent work is solidly teacher-dependent. overcome poorly designed centers or deal with Jonathan or Amanda, who can’t be left alone for more than 10 seconds. Students cannot learn in a learning structure which promotes constant behavioral issues. Plus, fair to say that all teachers are not wired the same way. For example, some can tolerate more noise than others. That doesn’t mean that the less tolerant teacher is less kid-centered, or needs additional classroom management staff development, or is misplaced at a particular grade level. 8. COLLABORATION: Most literacy centers don’t accomplish their purported purpose: using cooperative collaboration to learn. Much of the 1980s research on cooperative groups has been discarded in the literacy center movement. Groups are treated as merely collections of students working individually to complete self-choice learning tasks. Groups are primarily a necessary evil for a teacher “to put up with” in order to “free up” the teacher to do, say guided reading, with a small group (where the only real learning takes place). 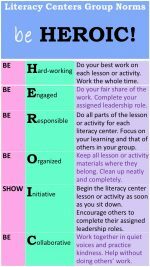 Floating around most literacy centers, observers would see minimal collaboration, no shared leadership or defined leadership roles, and a whole lot of Bella, the smart or responsible student, doing the work for her wanna-be-best-friend Samantha, the lazy or manipulative student. No accountability. No benefit of working together. 9. TRACKING: Literacy centers promote tracking. Because guided reading has become such a dominant feature of literacy groups, and most all guided reading groups involve homogeneous compositions, say by reading levels, the rest of the literacy groups tends to be cemented into same ability groups. Heterogeneous groupings can be incorporated into literacy centers, but most teachers chose not to follow this organization and management challenge. I, personally, favor a mixed approach of flexible homogeneous and heterogeneous groups, but literacy centers rarely reflect this mix. 10. DIFFERENTIATED INSTRUCTION: Literacy centers have been used to prop up many of the discredited features of differentiated instruction–an instructional approach of the late 1990s and early 2000s which tended to feature student choice based upon multiple intelligences, brain theory, and learning styles. 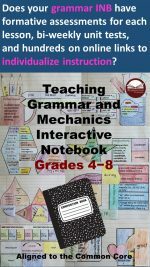 Although I constantly tried to co-opt the movement to suit my own views that we should teach different stuff to different students based upon the results of diagnostic assessments, teachers and popular authors favored the idea that we should teach different ways to different students based upon a myriad of other factors. For example, I see many literacy centers on sale on Teachers Pay Teachers which favor learning styles as determinants for independent student choices of learning activities. This, despite the fact that there is no empirical evidence to prove the existence or efficacious impact using learning styles to promote academic achievement. Truly, old theories take a generation to die out. Click HERE to learn more. Academic Literacy Centers are separate grades 4, 5, 6, 7, and 8 programs, designed to teach the Common Core English Language Arts Anchor Standards in writing, reading, and language. The literacy centers maximize learning through collaborative tasks, each taking from 15–20 minutes to complete. These six independent centers free-up the teacher to conduct mini-conferences with individual students, teach a guided reading group, or walk the classroom to supervise. A variety of rotation options provides flexibility and the addition of other centers as the teacher sees fit. I chose to include academic in the program title to reflect the rigorous lessons included in the Academic Literacy Centers. Unlike other literacy centers, which focus on hands-on activities, games, art, exploration, and creativity (all good things), these centers focus on learning the Standards. Students take biweekly unit tests (included) to measure their mastery of the key Standards. Now, this is not to say that students won’t enjoy any of the activities (they will), but I would rather have students learn content and skills than just have fun. If you were expecting a carnival of cute games and manipulatives, select another product. 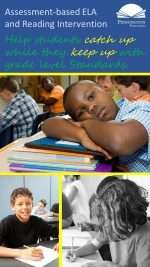 This is solid grade-level work and you, your parents, your principal, and most importantly, your students, will see measurable progress in mastering the grade-level ELA Standards. Are there unit tests? 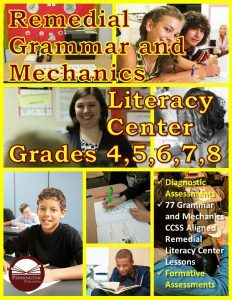 Yes, biweekly tests are provided on the grammar, usage, mechanics, vocabulary, and spelling content and skills. Answers, of course. What exactly is Common Core State Standard grade-level specific and what is not? 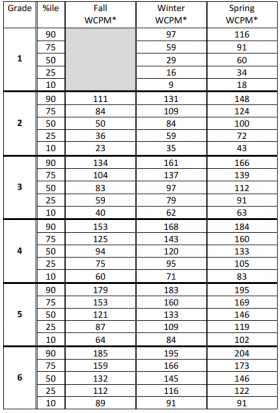 The sentence revisions (Writing Center), vocabulary worksheets (Vocabulary Center), spelling sorts (Spelling Sorts and Syllabication Center) each have separate grades 4, 5, 6, 7, and 8 lessons and activities. 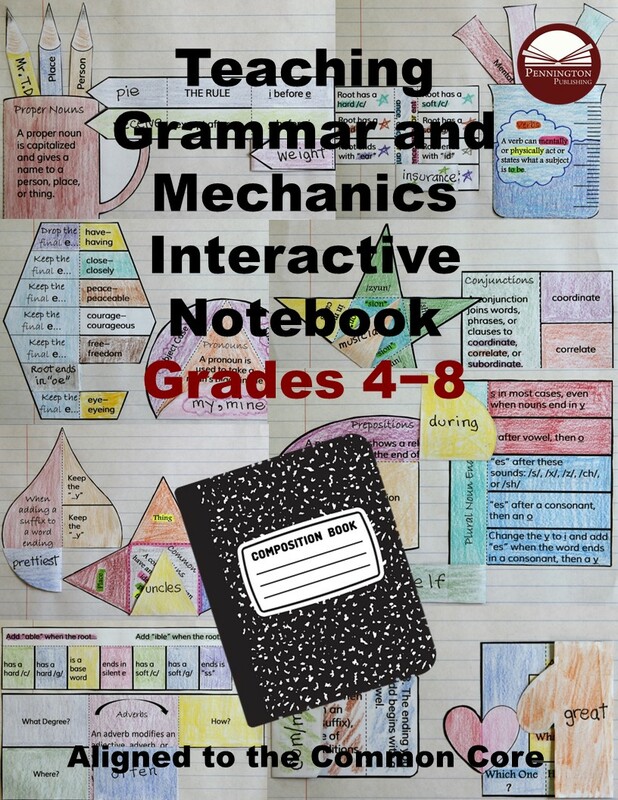 Other lessons and activities cover the breadth of the grades 4–8 Standards. 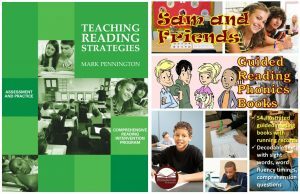 The reading fluencies and comprehension worksheets are leveled at third, fifth, and seventh grade levels.